I have been sneaking in little bursts of sewing the last few days, working on my Across the Seas QAL that I am doing with Jennifer and Sarah. When I chose to work with my layer cake of Kate Spain's Terrain and Kona Coal for my background I was pretty sure it would be lovely. Yesterday, I finished piecing all the squares and got them arranged the way I thought they would look best and then I thought, YUCK, I don't like it. Now my problem with the quilt has nothing to do with the design nor the instructions, Jennifer and Sarah made sure that those were perfect. It was me, I made so many cutting mistakes (my mind has been elsewhere of late) and I was not happy with my combination of the Terrain and Kona Coal. Fast forward to today. All the rows pieced together and then the lovely pieced border and another border of Kona Coal and voila! I love it! Due to my cutting errors I don't want to order more Kona Coal, so I will be making a modified version of the back that Sarah and Jennifer designed, probably using more Terrain and less Coal. The things I loved about making this quilt were that the design allowed for a little extra leeway for squaring up the blocks and the pattern is very forgiving if your inside seams don't match up perfectly! But seriously, look at the way those seams DO match up! I am really pleased with this quilt and think it is one I might like to make again. One thing I know for sure, I will be putting one of my new labels on the back. I designed these labels with Photoshop Elements 9 using a tutorial I found on Julie's blog. I ordered them from Spoonflower. That's 63-4"x6" labels on a yard of fabric. Pretty cool, huh? These are sew in labels and there is plenty of room to write a personal note on each about the quilt. I am really happy with them. I also ordered some twill tape labels with my blog name on them to attach to swap gifts that I make. They should arrive later this week and I will post about them after they arrive. I'm linking this post to Quilt Matter's Thank Goodness it's Finished Friday. I love this quilt - the labels turned out great! Its amazing how different the quilt looks with the added terrain inner border. It looks fantastic. Well done. Your quilt looks beautiful diane!! And the label printed via spoonflower is a fantastic idea! Very nice quilt. But most of the label. You do? I love the colors of this quilt! Beautiful! LOVE that quilt! It is so beautiful! I am so glad you changed your mind - it is lovely! I was worried until we got to the next day and saw you liked it after all. I was thinking how we were going to convince you that it was gorgeous! Because it most certainly is. Your quilt is absolutely gorgeous. I really like how the bright colors pop against the grey fabric (I think the fabric in Terrain is awesome!). Love your labels too. I have often thought of ordering some. BTW, where did you get your twill tape labels? 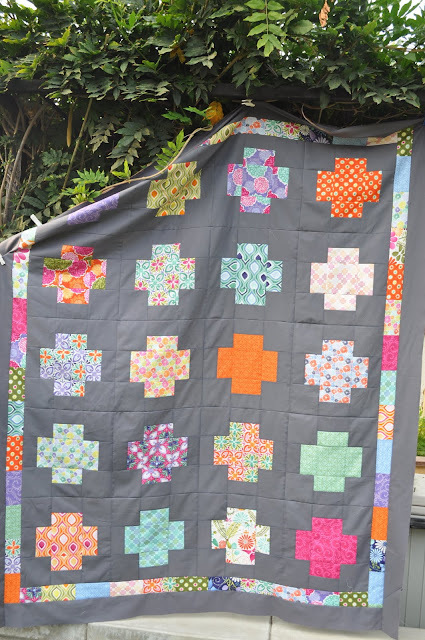 Your quilt is lovely- against the grey background the crosses really glow! Aren't you daring using the coal? It looks lovely - I just wish I could pluck up the courage. Labels are a great idea - were they expensive? It looks fabulous Di...as I said in my post, the scrappy border really brings it together! I have looked at these labels on spoonflower before - Im going to order some as yours look so lovely. I love the quilt. Where can I find the pattern. I will be checking out the labels. Yours is awesome. I love your quilt, you have done a good job with it. I'm so glad you kept with it, the quilt looks lovely. I have seen that tute before and wondered how computer friendly it would be. Your labels look so cool! And your quilt is lovely as well! I love the combination of Terrain and coal in your quilt! It looks so good! And your label design looks great as well. I need to try something like that. I've had the exact same thing happen to me ! I regularly leave a projec thinking it stinks, then return to it giving one more day of effort and fall in love. I'm so glad you've made friends with your quilt again. It's beautiful! I love the border you added to your quilt. I think it turned out gorgeous! I'm glad you decided to love this quilt, because I about screamed at the computer! It's GORGEOUS!!!! You did a beautiful job and the labels will be a great addition! It turned out really nice Diane! Love it!! What a difference the border makes! iIt turned out really nice Diane! Love it!! Oh I loved the look of this even before the border was added, now I really, really love it! your quilt is looking great diane, love the labels, brilliant idea! Love the quilt! the colors are fabulous -- is it a specific line or hodgepodge?? I love Kona Coal. The quilt looks lovely! Your ATS Quilt is beautiful. How did I miss it on Flickr? Is it in the group pool??? Those labels are an amazing idea! I had never heard of Spoonflower until very recently and now it is popping up everywhere. What an excellent idea. Thank you so much for sharing! It looks beautiful Diane! I am so glad you stuck with the coal- it really makes the colors pop. Your labels look great too! I love the quilt, the borders made all the difference. Even without the border, this is a beautiful quilt. I love the contrast between the coal and the Terrain. I LOVE your quilt. I know that sometimes I dislike things at first, but they grow on me, and I'm glad this one grew on you because it's so pretty. P.S. Labels look great too! Love your quilt - and your labels look wonderful too!! I love your quilt, the colours are gorgeous. I love your new labels too, they look great! great idea to print fabric labels! Love your quilt....Adding the scrappy order made it pop. Great job! Your labels are great.....can you bring a sample with you to the Summit. Glad you got it to where you liked it, when one works long on something it's disappointing to have it come out and not be what you want. It looks awesome. you're right, the two borders make all the difference! love the finished top! I love your quilt! I decided to use Kona Charcoal, I just love the unexpected brightness that the dark background gives to the fabrics. They just glow! Diane, the quilt looks great! The colours really pop against that background. The border sets it beautifully too. Great job! I love your labels too. Very cool! Thanks for linking up to TGIFF! beautiful! i thought it looked great either way, lol, but definitely love the border. Great colors and the border makes it! I think the quilt looks great! I'm glad you liked it when it was sewn together. And the labels are so cool!